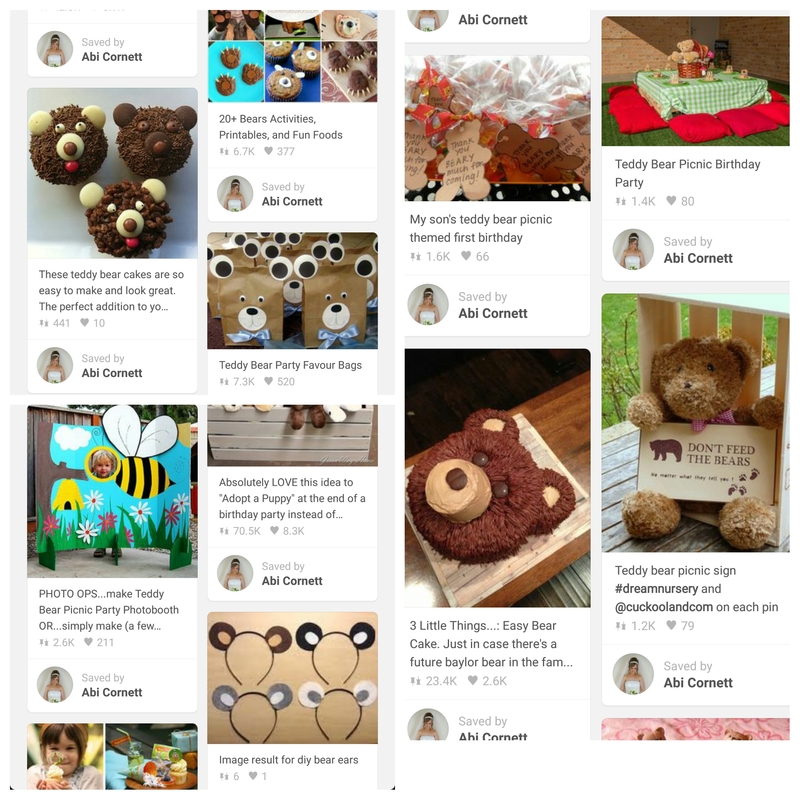 Here at Something About Baby, we’ve been planning Alfie’s first birthday for about 6 months! It started with a Pinterest board which turned into a list which turned into a notebook full of lists, which turned into a pad full of diagrams and drawings. 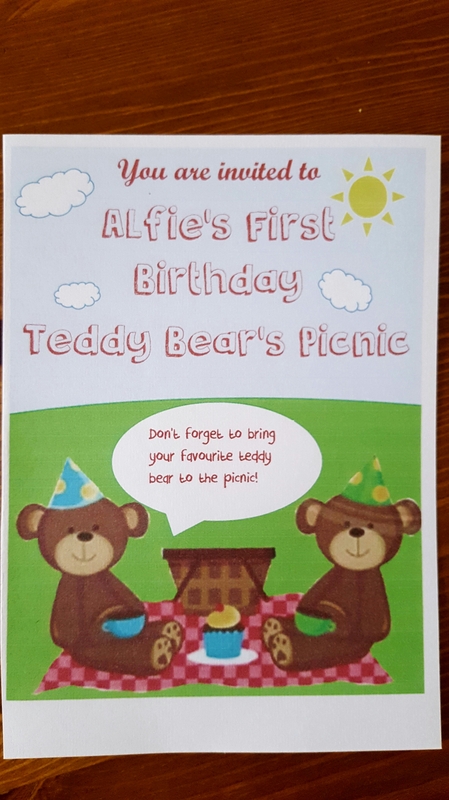 It was decided early on that Alfie would have a Teddy Bears Picnic for his first birthday party. How did you choose the theme? As Alfie’s birthday is in July, I thought it would he nice to have it outdoors, so a picnic was ideal. We also have also always used the nickname Alfie Bear, so it was kind of fitting for him. There was a bit of a to-do with the venue in the early stages. We couldn’t really afford to hire out a hall and we live in a flat so don’t have a garden. I thought about holding it in a local park but then thought it would be difficult with toilets and food and decorating, then my sister offered her garden until she realised she would be working, so I begged asked my parents if I could borrow their back garden. I had used it for my baby shower and it worked really well, so I was pleased we could make use of it again. How did you start planning? We then did a small buffet for the adults which included a platter of sandwiches, sausage rolls and cocktail sausages, chicken dippers, crisps and bear rice crispie cakes. We also offered ice cream cones for dessert. How did we keep to our theme? I started with the invites and used an image I found online to create my own – they aren’t professional, and were just printed off my computer, but I was pleased with the results! I bought a red and white tablecloth for the babies to sit on while they ate their picnic. This was picked up at Aldi during the baby event. I bought a helium cannister to blow up my own balloons and used this to create bunches that sat on the corner of the blanket. I did buy a number one balloon, but unfortunately it hadn’t been tied to the weight properly and it blew away before I’d even taken a photo!! 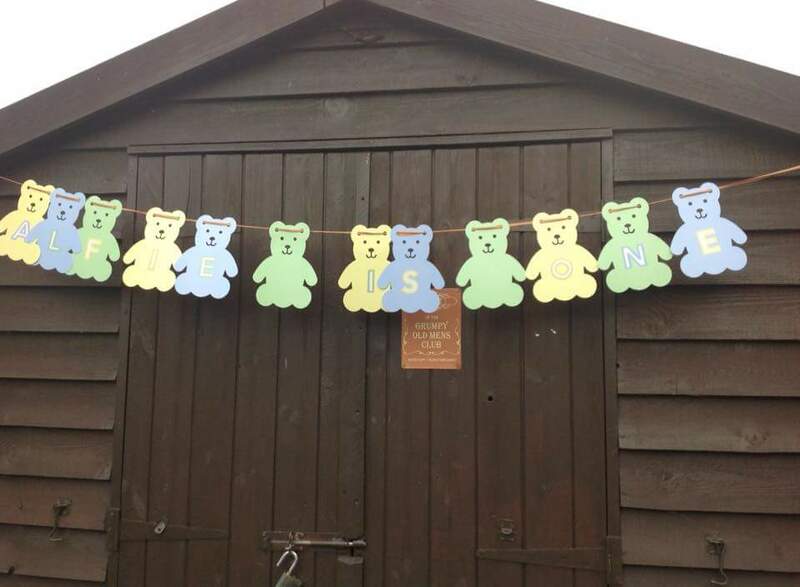 On a stroke of luck, I came across this cute teddy bear bunting in Asda that you could personalise with your own words, so I did one that said “Happy Birthday” and one that said “Alfie is One”. I then reused this to put up at home on Alfie’s actual birthday. I also bought red and blue bunting to hang around the marquee. 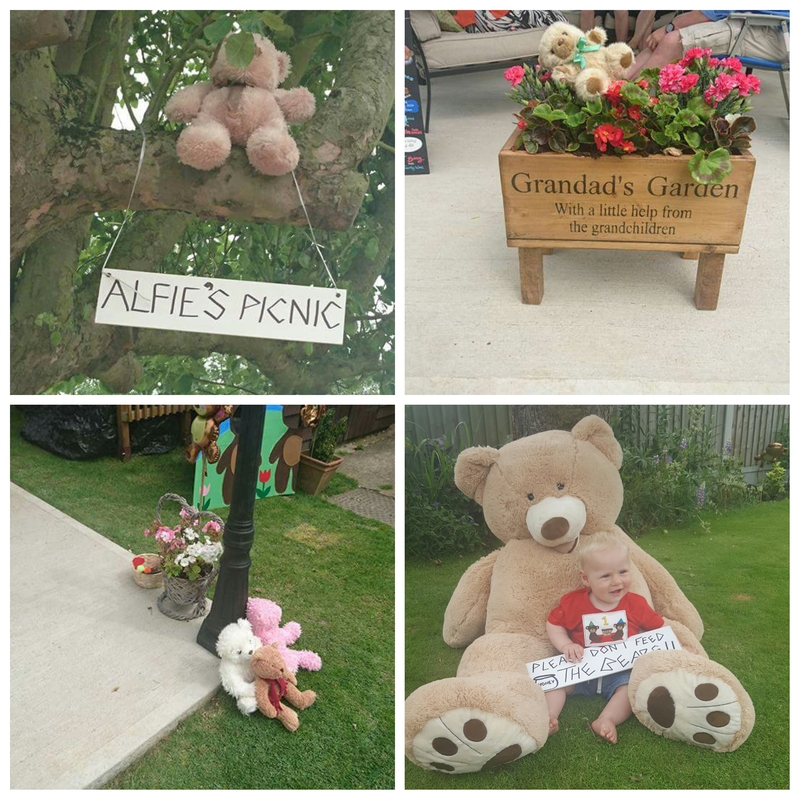 I hunted down some old teddy bears from charity shops and people getting rid, to hide around the garden amongst the flower beds etc just to add a little extra touch to the theme. 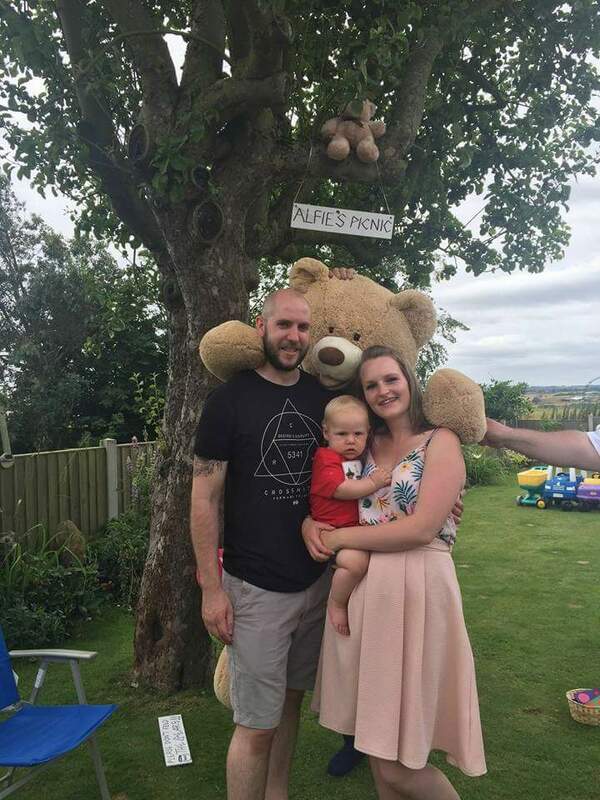 I was super excited when I came across this giant teddy bear – it really added some fun to the party! I made teddy bear party bags to give out to the guests at the end of the party. I bought some brown paper bags and then fashioned them to look like a teddy bear. A slice of cake was then be added once it was cut up. 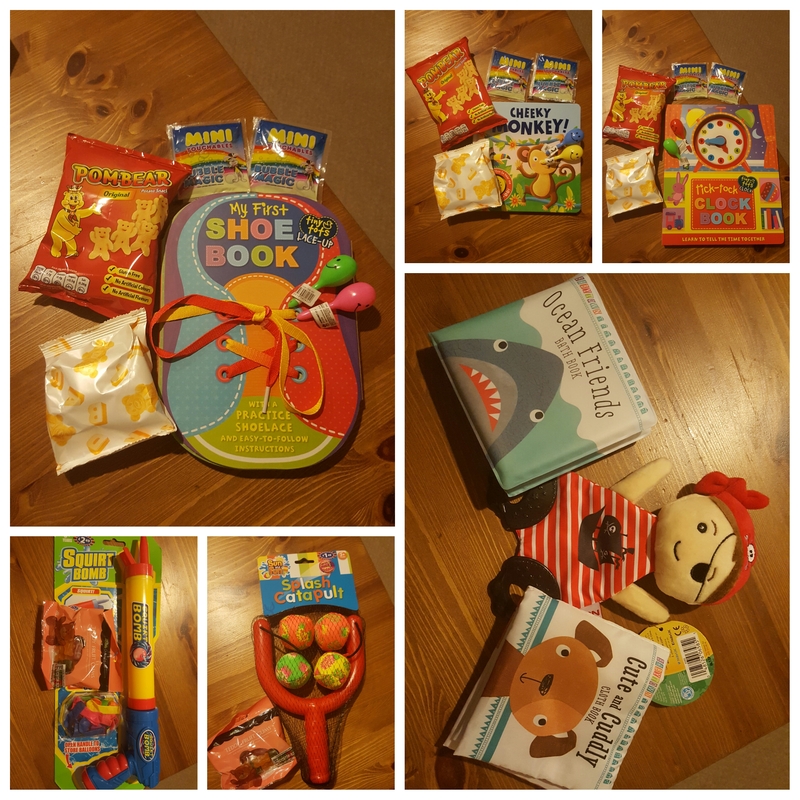 We had a couple of older children who got a water gun and a packet of sweets each and a young baby who got a cloth book and a teething toy. What extra touches did we have? I decided to make a teddy bear cutout for people to have their photo taken with! I saw the idea on Pinterest and had time, so quickly made one up. 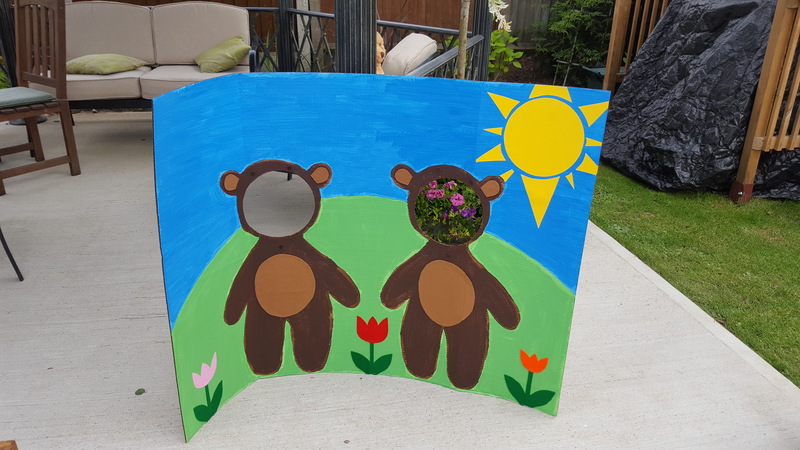 It was quite simple really – I bought a trifold presentation board from Hobbycraft, painted it and stuck on the bears and then cut the holes out for the head. Everyone loved it, and we got some fab photos! I made little bows and party hats that you could take off and swap around. I also planned to put up photos of Alfie from the past year but unfortunately it was too windy and they kept blowing down so we had to abandon this idea. I did however have an amazing birthday board made up for Alfie by a lovely lady I found on facebook, called Sweet Chalk. It was better than I could have imagined, and such a reasonable price. What activities did you have? As it was quite a small party, I didn’t go overboard with the activities. We hired some soft play for the garden and my sister bought over a mini bouncy castle and there were a selection of toys to play with. My sister offered to make the cake – she has her own business and is amazing, so I was excited to see what she would create. I sent her a few ideas but ultimately said she was free to do anything that fit the theme. I wasn’t disappointed and it tasted as amazing as it looked! She also made me some lovely cookies. It wasn’t fancy dress, but I wanted Alfie to wear something that fit the theme, so I had a tshirt made for him by Sew A Little Happiness. It was amazing!! She also made me a matching card using Alfie’s invite as inspiration and it was just perfect, I was so pleased with it. I use Claire a lot for my special occasion cards, and she is totally brilliant, so please do have a look at her stuff. 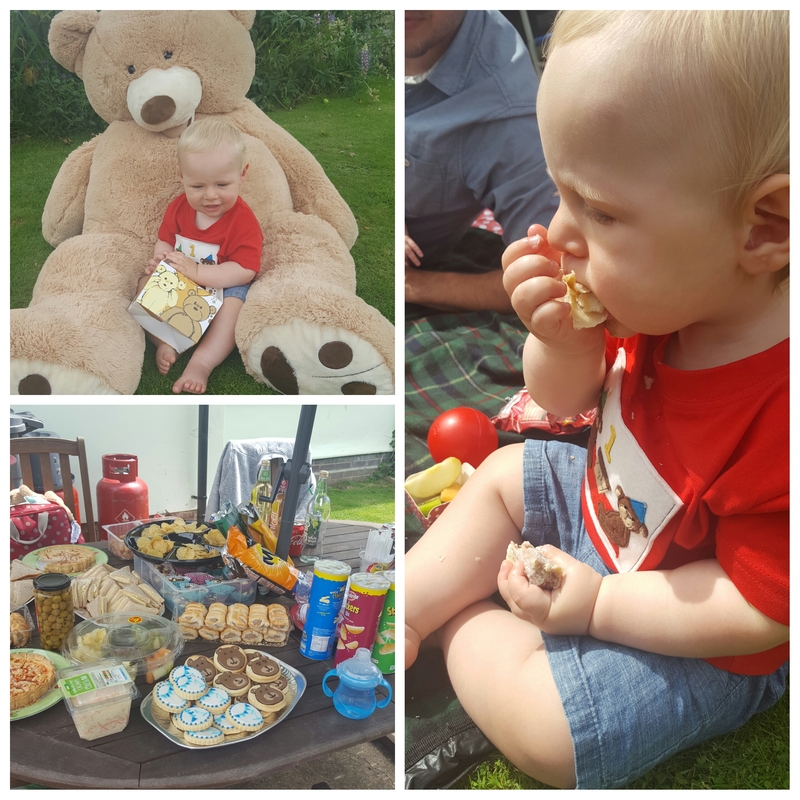 We had a fantastic morning for Alfie’s first birthday party. The weather was fab in the end, despite a little wind at the beginning (luckily, I don’t know what we would have done if it was crap!) and everyone enjoyed themselves, especially Alfie! I’m so glad we had the party for him as it has created some special memories for us. Your baby is only 1 once, and I think this should be celebrated! I don’t really know where the idea came from, other than its summer so a picnic made sense, so it kind of snowballed from there. Was great fun to organise! Thanks for reading. Amazing! 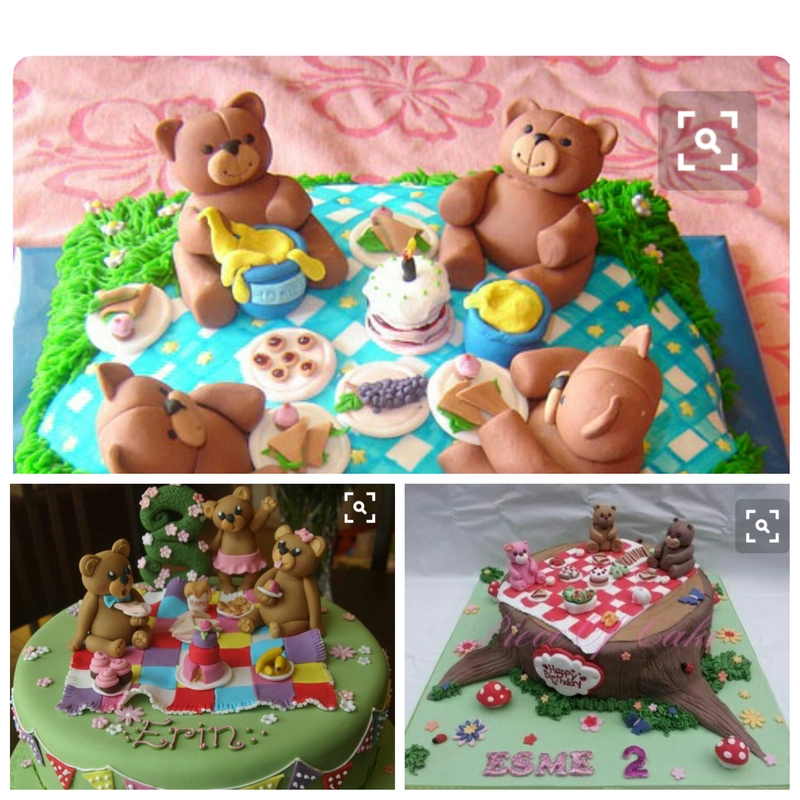 Thank you for the inspiration, I love the idea of the cut out & teddy bear party bags. So many little touches to remember & memories to cherish. Ah thank you! It was so much fun to organise and we had a great day. 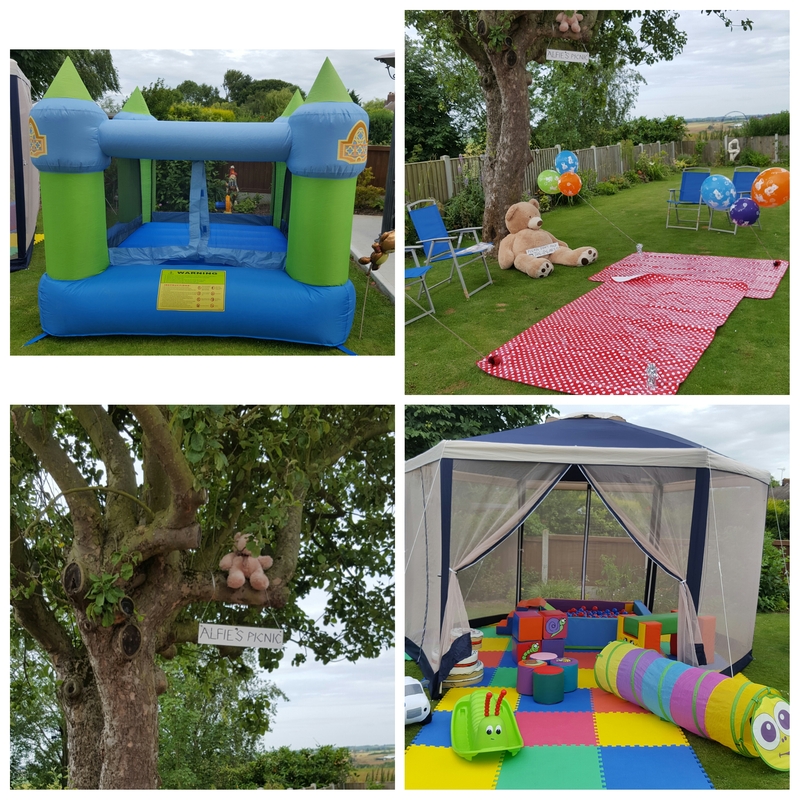 I’m a big believe in the little touches to really make a stand out party, and it doesn’t have to take loads of time or money. I loved the photo cut out, we got some fab photos!